Melody has been with MVH since 2009. She started as a volunteer and worked reception until Dr. MacQueen hired her in May of 2010. 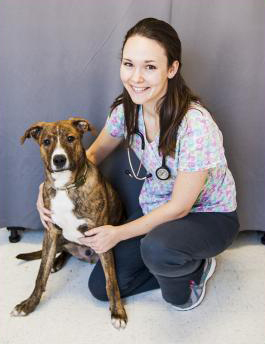 She graduated in 2015 from Blue Ridge Community College with an associate's degree in Veterinary Technology. She has a true passion for all exotic animals seen at Midway, and plans to obtain her VTS (Veterinary Technician Specialist) in Clinical Practice: Avian/Exotic. When she isn't working, Mel loves to spend her free time with all of her fur babies; she has two cats (Frodo and Levi), two dogs (James and Doofus), 2 budgies (Bleu and Ami), and a mustachioed parrot (Moka). She also enjoys reading, renovating her house, and spending time in nature!